The departure point is the artists’ respective interests in a geological universe that has been based upon research materials gathered from specific locations in the Norwegian-Russian border zone. In collaboration with the curators and producers behind Dark Ecology – the Dutch organization Sonic Acts and the Kirkenes based curator Hilde Methi, Terminal B showcases new work that is representative of the two artists’ continued processing of the materials that stem from their involvement in the Dark Ecology project (2014-2016). Dark Ecology was inspired by the ideas of the philosopher Timothy Morton, who argues that our knowledge about the human impact on the globe makes it necessary to rethink the concepts of nature and ecology. Ecology is ‘dark’. At 12 kilometres deep, the Kola Superdeep Borehole (KSD) is one of the deepest man-made holes on Earth, and a remnant of a Soviet geology research project that started during the Cold War. In addition to gathering data about the geology of the Earth’s crust, it was also part of Project Globus, a network of seismic listening stations which functioned as an early-warning system for natural disasters, as well as the monitoring of enemy nuclear tests. 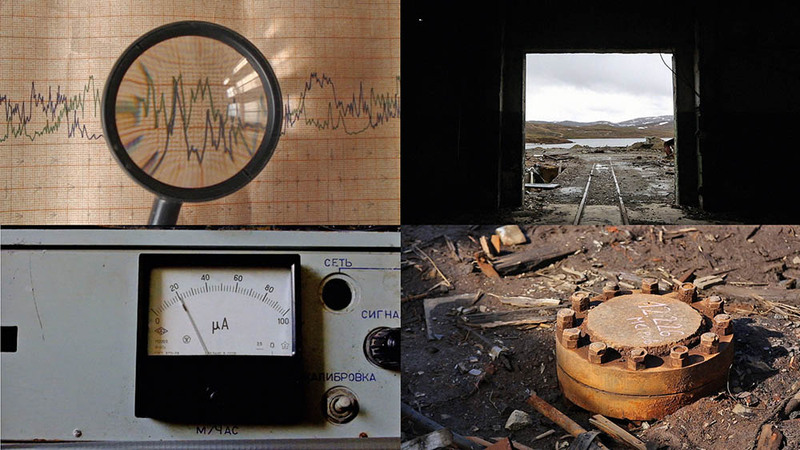 After the fall of the Soviet Union, the project was slowly decommissioned and the Kola Superdeep Borehole was eventually abandoned in 2008. Justin Bennett’s Vilgiskoddeoayvinyarvi – Wolf Lake on the Mountains is told from the perspective of Viktor, a fictional geologist who worked on the KSD project, and who decided to continue living at the derelict site when all his colleagues had left. Viktor’s voice guides us around the KSD, linking the features of his surroundings to aspects of the past, to his own practice of “listening to the earth”, and to the connections between the geology of the area and Sami shamanism and divination. In addition to the video, the exhibition showcases a rich selection of Viktor’s drawings. Justin Bennett (UK/NL) is an artist working with sound and image. He studied sculpture and electronic music and much of his work combines the two aspects of sound and space. He often uses sound recordings together with spoken words to immerse the audience in a story or to subtly change their perception of a place. During the first phase of Prospecting: A Geological Survey of Greys, the artist Cecilia Jonsson commissioned a drilling operation at Prestefjellet, near Kirkenes in northern Norway, where cylindrical rock-core samples were extracted from 2.5-billion-year-old primary rock, 170 metres below the earth’s surface. The rock cores of metamorphic gneiss were originally displayed as sculpture beside the borehole, then shipped to The Geological Survey of Norway’s laboratory where the artist conducted various analyses and microscopy of the stone in search of the bedrock’s shades of grey tones. The installation consists of thin section photomicrograph of the rock accompanied objects and other materials from the process. The project makes visible geology as a visual composition, and as a challenge to the human perception of colours. Cecilia Jonsson (SE/NO) is a visual artist, whose research-based projects spans installation, sculpture, sound, image, and mechanical work. Central to her practice is the weaving of a delicate poetry of connections between the natural sciences, materials, aesthetics, technology, and environmental politics.